How much can one person’s quiet, consistent love affect the path of generations that follow? More than mere words can say. And yet, words must tell such stories. Here is one journey spanning three generations. My maternal grandmother was Helen Molnar. The photo on the right-hand side shows her at her high school graduation in 1939. Her abiding quality was kindness, of a depth and genuineness rarely seen. I knew her as a granddaughter knows a grandmother: as a source of steady encouragement, as someone who would listen closely to your thoughts, and as a woman who worked hard her entire life yet always had time for an embrace, a cup of tea, and conversation. She shared her love of cooking with family and friends throughout her lifetime, baking endless loaves of Hungarian kolach bread and mountains of kifles and bow tie cookies (csoroge) in a walk-thorough galley kitchen that must have measured about 9 feet by 15 feet. 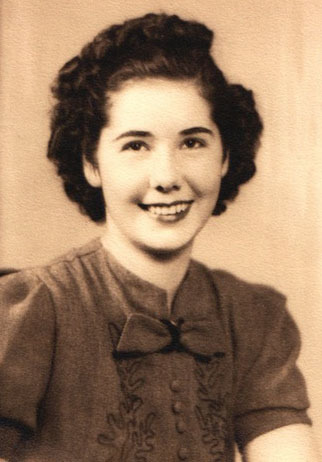 She was also grandmother to my cousin, Jon Molnar, who absorbed every ounce of her passion for hand-crafted food. Jon baked and cooked side by side with Grandma Helen. He was riveted by her intuitive sense of the precise moment to add oregano, the exact pressure to apply to the strudel dough so it would stretch rather than break, and which cabbage would yield succulent töltötkáposzta. And most of all, he learned first-hand that the act of nourishing someone by cooking for them is an act of love. It was no surprise that Jon chose the culinary arts as his profession. He attended the Pennsylvania Institute of Culinary Arts and worked tirelessly as in a variety of settings, from commercial kitchens to private sectors to his own establishment. Then, he launched his own brand of food products: Chef Jon Culinary Creations. 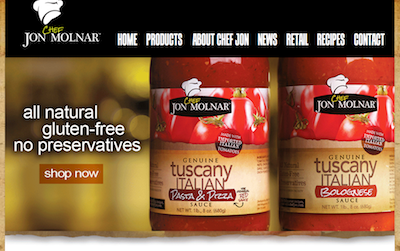 A flagship product line for Chef Jon is the Genuine Tuscany sauces. Made with tomatoes sourced from Tuscany, they are deeply flavorful, and far different from the typical thin-palate salty fare of most bottled pasta sauces. As demand for the Chef Jon Genuine Tuscany pasta and pizza sauces grew, Jon and his wife Cheryl – a professional graphic designer – realized that they would need food photography images to help market the product to consumers and approach retailers to discuss product placement in stores. They hired Madison photographer Clint Thayer of Focal Flame Photography for the series. “The goals were to shoot the sauce as product shots (on white backgrounds) and to shoot the sauce in a kitchen setting,” said Cheryl. Clint worked with Orange Tree Imports to ensure that the demonstration kitchen background was authentic and warmly lit, taking care that the vibrant color of the sauces invited the eye. Even within glass bottles, the ruby hues were evocative. “Clint provided crisp, well lit product photos,” said Cheryl, adding that as a design professional she appreciated the creative approaches Focal Flame Photography provided. And of course, after the photo shoot, there was an opportunity to try the sauces. Gathered around the table with my family, I took a bite of spaghetti with Bolognese sauce and was immediately transported back to that tiny galley kitchen. The flavor may have been Italian rather than Hungarian, but the signature was unmistakable: this was something that was developed through love of the craft, through a sincere desire to offer a gift of food carefully prepared. I had to catch my breath at the sudden memory of Grandma Helen, beaming with pride in an apron with flour-covered hands. “Jobb adni, mint kapni,” she might say. It’s better to give than to receive.